This is a very large collection of old movie clips, TV shows, TV ads, and newsreels etc. The clips cover an incredible array of topics. For older folks, there is much nostalgia here. For younger people, this is a chance to view clips they have not had the opportunity to see before. Many if not most of the clips have creative commons attributes and might be useful for school projects. 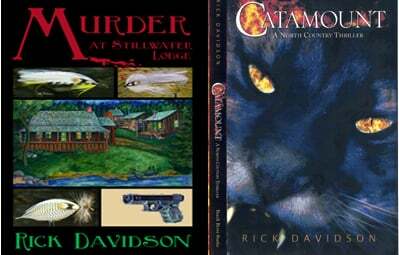 Here is the link to the trailer for my new book “Murder At Stillwater Lodge“. Take some time off and take advantage of these great summer reads. If you have a smart phone check out Cornell University’s “Merlin Bird ID”. If you see a bird you are not familiar with, answer five questions. Where? When? What size? Color? Was the bird…? When you have answered the questions, the app searches its database and creates a list of pictures for all of the possible matches. It also provides information on the bird, a location map, and recordings of the bird’s songs and calls. “Merlin Bird ID” is available from the “Google App Store” and from “Google Play”. Try playing the recordings and see how nearby birds react. I number of years ago, I helped out on a low budget independent film. I remember someone accusing the film makers of being “wannabes”. Don’t we all start out as wannabes? If you are engaged, as Paul McCartney points out, the ambition grows, you learn more and you practice more. I can’t help but think that the job of a teacher is to encourage and nurture the engagement that leads to the ambition to learn. What will engage us is different for everyone of us. Sir Kenneth Robinson passes on some wisdom from Paul McCartney. I found this on Larry Ferlazzo’s “Websites of the Day” site. Larry’s site is a great resource for all educators. Safeshare.tv is a service that allows you to convert a YouTube link so that the viewer only sees the video. The up next list that normally appears to the right of a YouTube video is not visible. While that list is useful for finding similar videos, often the featured video are not school appropriate. Bottom line is that safeshare.tv eliminates all distractions and shows just the movie you wish to watch or show. The service is legal. It also offers a download option and the video can be shared in a multitude of ways. This is a very useful tool for teachers who want to show or share a video without the usual YouTube distractions. Many of the teachers in the Governor Wentworth Regional School District have been making use of Google Classroom It is an excellent way to organize assignments, provide formative assessments, archive student work and save time. It is a very useful addition to Google Apps for education that we are all using. It is free and easy to use. Now that our district has increased bandwidth at all of the schools, we now have the power to use Google Classroom effectively. Educational Technology and Mobile Learning has posted an excellent, easy to understand tutorial on how to us this great tool. Everything Teachers Need To Know About Google Classroom. Educational Technology and Mobile Learning have created a list of 22 Google Chrome Apps that are useful for education. The list is not exhaustive but I have found most of these to be useful. Here is another article that is interesting look at Argument Writing across Content Areas by Heather Wolpert-Gawron. I am reading Minds Made For Stories by UNH English Professor by Thomas Newkirk. Professor Newkirk challenges the idea that narrative writing and informational writing are different. He maintains that narrative storytelling is, in his own words, the Mother of all Modes” of discourse. Both Wolpert-Gawon’s and Newkirk’s arguments are very compelling and should be considered as the Common Core calls for more emphasis on information reading and writing. I have been playing with Google’s Speech Add-on. It actually works quite well. It appears to recognize some speech recognition commands but not all. For example, saying “new line” starts the next sentence with a capital letter. “Saying “full stop”creates a period, “question mark” creates one. Google “speech recognition commands” to get a full list of possible commands. The add-0n is at the Google Store. This works better than most speech recognition software I have tried in the past and it is free. This is Neil deGrasse Tyson’s response to a six year old that asked him about the meaning of life. For quite some time I have been looking for either an open source or online alternative to “Microsoft Publisher” and “Adobe In Design”. I think I have found it Click on “Connect more apps” on the “New” drop down menu in “Google Drive” and add it to your apps. There are easy to use templates for brochures, business cards, pamphlets, invitations, photo books, newsletters, magazines, etc. If you go to “Lucidpress” pricing, you will see that this app is free for educators and students. The final publication can be downloaded to the computer and printed. It can be exported to Google Drive. “Lucidpress” can be used on Chromebooks. It is encouraging to see that more and more cloud apps are being developed that provide alternatives to traditional software. The WeVideo app also provides a cloud alternative to “iMovie” and “Windows Movie Maker”. These apps make Chromebooks even more useful in the classroom.